The role of the diabetes specialist nurse is hugely important in ensuring high-quality diabetes care. 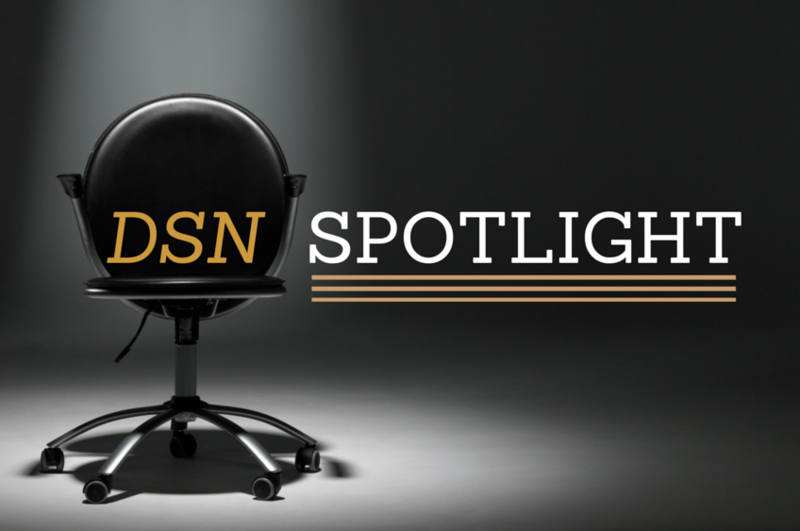 Our DSN Spotlight series celebrates this great position and also aims to find out more about those who are making a difference to people with diabetes every day. I have been a DSN and educator since August 2017 so 8 months now, however my father is type 2 diabetic and a cousin of mine is type 1. I have been aware of Diabetes since a very young age, and it was just a part of normal life. As a student nurse I always had a keen interest in diabetes, and had placements on our old diabetes ward many times, and with the DSNs. I also completed my dissertation for my BSc Adult Nursing degree in diabetes. After this when I qualified I was a cardiology ward nurse and was the Diabetic Link Nurse, therefore supporting staff members in keeping up to date and good practice etc. What’s your biggest challenge in diabetes today? That’s a difficult question – there are few and it’s potentially what we prioritise as the biggest challenge. The biggest challenge is not diabetes itself, but our knowledge behind it. Things have changed over the years and updating all nurses, including our wonderful and experienced nurses, is a steep mountain to climb. Although, I feel the biggest challenge is the fear surrounding diabetes as a condition. For nurses and doctors, the fact it is not clear cut, and black or white acts as a hindrance and in a sense scares them off. 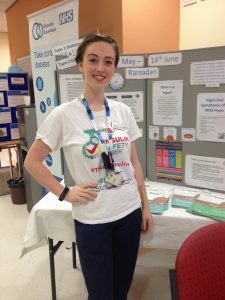 It is such a vast subject that even some of our experienced and shining consultants feel uncomfortable in managing diabetes in an acute and chronic setting. The challenge I have is to dissolve that fear surrounding diabetes and instil a sense of confidence within our NHS. Diabetes is an ever expanding condition and we need to tackle that head on. What is your biggest achievement in diabetes care? Again another difficult question. Being early on in my career as a DSN there are a few that spring to mind. When intensive management of ringing patients multiple times a week results in them getting good blood glucose control so that they get the surgery that they desperately needed, when a HbA1c comes down from 126 to 80 in 9 weeks, however these are not my achievements but the achievements of our hard working patients with renewed enthusiasm. The biggest achievement we have which is a shared contribution of the inpatient DSNs, is the success so far of insulin safety week. We created insulin safety flash cards which breakdown insulins quickly into what types of insulins there are. This has become a national resource, and has been used across the NHS within the campaign. However, these are as a result of the support and care my team have given me over the last few months, recently they have been identified as giving outstanding care – there isn’t a question then can’t answer, and isn’t a situation they won’t help with. What would you like to see change in diabetes? The fear surrounding diabetes management to dissolve and dissipate. Diabetes is an ever expanding problem with 3.7 million people currently diagnosed within the UK – we as a united force within the NHS should feel comfortable in managing our patients on at least a basic level. I would like our student nurses, nurses, physician assistants, consultants, doctors, surgeons to take pride in saying that they can do this. I would like to see diabetes medication and insulin errors reduced, and therefore potentially cutting length of stay and improving the care we provide. There are of course changes as a team we all want – technology is a step behind, and funding is a step behind that again. A lot of our patients are given the option to self-fund treatments which not everyone can do. We shouldn’t be putting a price on people’s health. What’s the biggest development within the last 10 years? There are so many wonderful advances within diabetes. CGM, pumps, the Libre, blood ketone meters, carbohydrate counting e.g. the DAFNE course, and our DISC course for the Countess of Chester. My favourite recently is the Insulinx in easy mode – for those who maybe can’t manage carbohydrate counting but are still giving the opportunity to be flexible with their insulin and potentially tighten their control. A big thing for our trust is providing the education to patients, carers, nurses, HCAs and students a support network for people to turn to. The potential to have virtual clinics with the help of meters that can upload data is an exciting prospect to try and reach those that can’t come into clinics 9am to 5pm Monday to Friday due to work commitments or family life etc. Currently we do have the ability to skype patients, but this is definitely something that could be expanded. What is the best way to achieve good health outcomes with your patients? There are many different approaches and that depends on what your patients want from you. Sometimes a laugh and a friendly face gets the best response out of people, realising we are human and understand the rises and falls of coping with diabetes – we are all human we all have our vices and stresses in life. Others require the support of someone to take control of their diabetes when everything is too much. My senior DSN has a high frequency clinic, and they require the intensive input of weekly clinics however it has given them a better quality of life and their admissions rate remains lower than previous. All patients want us to listen and instead of berating them for the poor control they have had, look upon it positively and understand why situations out of their control have made their control worse, or help them improve. The bottom line is to be approachable, friendly and contactable. Diabetes requires trust and a relationship, it is chronic condition that we must work together to control and abolish.